Barefoot boys in Kenya run around using a wire stick to guide hoops or wheels, while girls toss rocks or balls made of rolled up socks. This is play. No coaches or drills; no fancy equipment or video games. Just self-challenge and a sense of community. 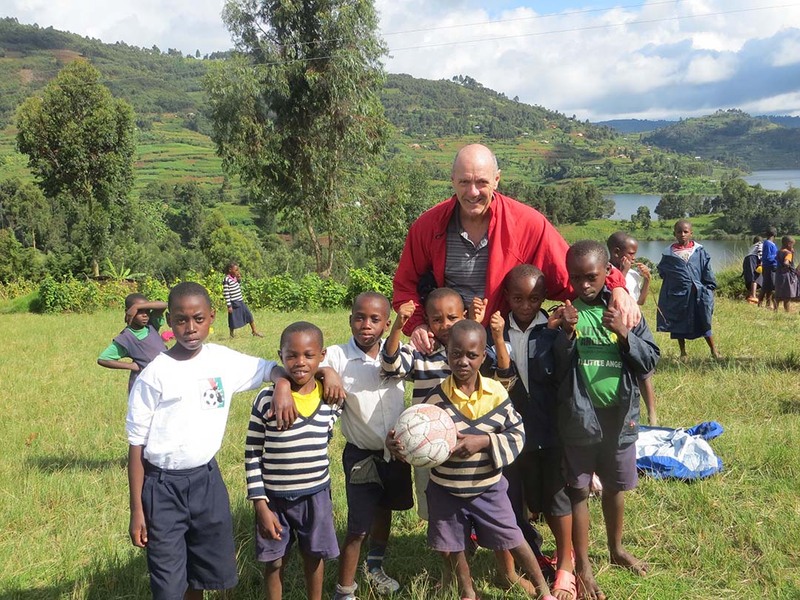 Dr. Peter Hastie, a Physical Education Teacher Education professor in the School of Kinesiology, recently spent a week in the East African Mission Orphanage in Kenya. Over 200 children from infant to age 17 live in dormitories and go to school there. Hastie stayed in a lodge near the orphanage as part of a safari in July 2014 when he was first acquainted with the orphanage. One night he met the kids and had dinner with them. The orphanage receives income from the lodge rentals and establishes contacts to sponsor a child or items for the orphanage, such as swings. It takes $17,500 a month to run the place with 41 staff members. The tourists defray the costs. From this experience, Hastie felt inspired to return. While at the orphanage, Hastie conducted a project on what the kids do for play and tested their motor skills – running, jumping, leaping, and throwing. He is comparing them to U.S. norms for their age. Most of the orphans are sufficiently developed and have mastered their skills by age six or seven, according to Hastie. He took sporting equipment, including jump ropes, balls, and Frisbees, which never got thrown, but were rolled with a stick around trees and over dirt mounds. Meanwhile, the girls throw and catch rocks, much like the game of Jacks. They also play ball games using balls made out of socks. The children worked at the orphanage in the morning. The younger kids picked up trash in the corn field. They all flexed their muscles when Hastie said, “show me your muscles!” The older kids worked in the banana fields with machetes, composting the soil. The oldest kids made their toilets for the dormitories. During the visit, Hastie also observed the classroom resources. He plans to make posters for classrooms in Kenya and Uganda. Kids in elementary schools here in the U.S. will design the posters. Their pictures will be on the back of the posters along with a written a note to the kids in Africa. “This is not refrigerator art; it’s going to another country for learning.” Hastie said. Moreover, each Auburn University Early Childhood Education / Elementary Education major wrote a book for 25 kids in Uganda for non-sponsored kids last year. The students will do it again this semester. Dr. Hastie sponsors two high-school students at the orphanage by paying for their boarding school. He also sponsors two 11-year-old children in Uganda. He plans to go back to Uganda in March. Then, he will go to Kenya again in July for a week or two, along with a short stop in Bangkok, Thailand in May to purchase inexpensive clothes for the children. Dr. Hastie has been named a Wayne T. Smith Distinguished Professor two times. He has been cited in publications 1,814 times since 2010. His 2011 Sport Education textbook is the most cited research book in physical education. In 2013 he was inducted as a National Academy of Kinesiology fellow, comprised of the 100 most distinguished Kinesiology researchers in the world. Congratulations and thanks to Dr. Peter Hastie on work well done!